The 2017 Red Kettle Campaign raised $144.5 million. That's down from $147.3 million in 2016, and down from 2015's record of $149.6 million. 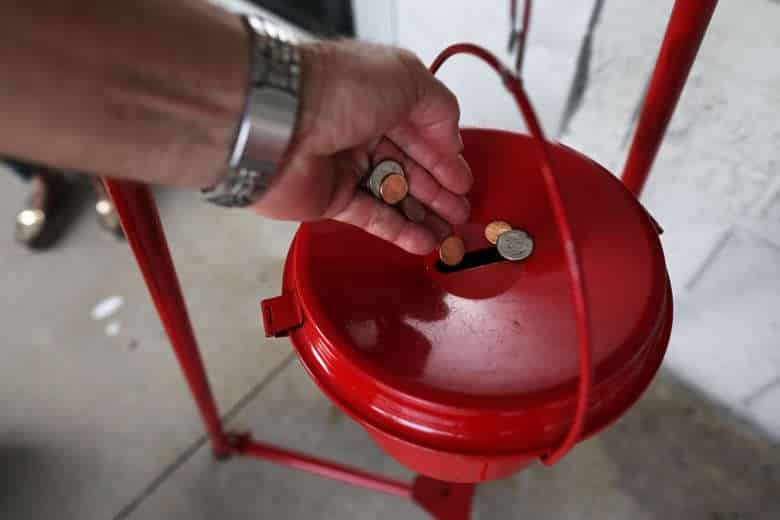 WASHINGTON — After hitting a record in 2015, the Salvation Army’s annual Red Kettle Campaign last year saw a decline in kettle contributions for the second consecutive year. The 2017 Red Kettle Campaign raised $144.5 million. That’s down from $147.3 million in 2016, and down from 2015’s record of $149.6 million. The Salvation Army, which has its national headquarters in Alexandria, Virginia, also raised $45.5 million in online donations last year, a 26 percent increase over 2016. The Salvation Army uses funds it raises to provide more than 25 million people throughout the year with more than 56 million meals and 10 million nights of shelter. It also funds youth programs, summer camps and adult rehabilitation services. Kettle ringers in parking lots outside of Walmart and Sam’s Club stores across the country raise the most each year, contributing $43.4 million to last year’s total, or about 30 percent. Volunteers did their bell ringing outside of 6,400 Walmart and Sam’s stores last year. Bell ringers at Kroger stores, J.C. Penney Co. locations and Walgreens were also top contributors to the Red Kettle Campaign last year.